Versify presents books to electrify, edify, and exemplify! NEW YORK, Jan. 30, 2018 /PRNewswire/ -- Houghton Mifflin Harcourt Trade Publishing today announced a new imprint in their Books for Young Readers group curated by Newbery Medalist and educator Kwame Alexander. Versify will publish innovative creators with fresh stories. The imprint reflects Alexander's vision that accessible and powerful prose and poetry—in picture books, novels, and nonfiction—can celebrate the lives and reflect the possibilities of all children. Seeking new authors and artists as well as established writers and illustrators, Versify will publish books that explore the beauty, hurdles, and hopefulness of life . . . books that will engage, entertain, and empower young people to imagine and create a better world. "I get asked what will make Versify different from other imprints," says Kwame Alexander. "The truth is we are not reinventing publishing. It's the same ingredients in our kitchen as everyone else's: we want to publish books for children that are smart and fun, that inform and inspire, that help children imagine a better world. My goal is just to make sure there are more chefs in the kitchen, more voices in the room, that create unique and intelligent entertainment that electrifies and edifies young people. So yes, I too am looking for the next Mo Willems and Jacqueline Woodson. It's just that I plan to look far and wide in places unseen to most. As Langston Hughes said, 'Life is a big sea full of many fish. I let down my nets and pull.'" Working alongside Alexander will be his editor, longtime HMH Sr. Executive Editor Margaret Raymo, Editorial Project Manager Erika Turner and an advisory council of students from across the country. Versify will launch in spring 2019. The inaugural list will include This Is For Us, a picture book that pays tribute to the sacrifices and triumphs of African-Americans, written by Kwame Alexander and illustrated by acclaimed artist Kadir Nelson; The Last Last-Day-of-Summer, a middle-grade modern day Phantom Tollbooth, written by founding member of We Need Diverse Books, Lamar Giles; ¡Vamos! /Let's Go! the first in a new bilingual picture book series by Pura Belpre award-winning illustrator Raúl the Third; and White Rose, a young adult novel in verse that tells the true story of Nazi resistance leader Sophie Scholl, by YARN Poetry Editor Kip Wilson. Catherine Onder, SVP and Publisher of HMH Books for Young Readers said, "We're thrilled to partner with Kwame on Versify. From The Crossover to his international touring to his extensive literacy work with students and teachers, he brings an extraordinary vision, passion and outreach that will surely resonate with readers young and old, long into the future." 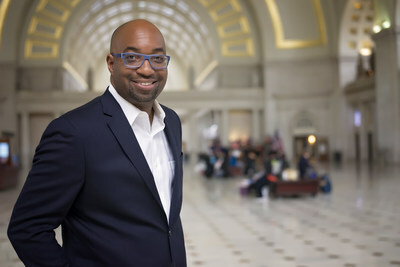 Kwame Alexander is a poet, educator, and the New York Times Bestselling author of 25 books, including REBOUND (Pub Date: April 2, 2018), the follow-up to his Newbery Medal-winning middle grade novel, THE CROSSOVER. Kwame writes for children of all ages. Some of his other works include THE PLAYBOOK: 52 RULES TO HELP YOU AIM, SHOOT, AND SCORE IN THIS GAME OF LIFE; picture books, ANIMAL ARK and OUT OF WONDER; and novels, SOLO and BOOKED. A regular contributor to NPR's Morning Edition, Kwame is the recipient of several awards, including The Coretta Scott King Author Honor, The Lee Bennett Hopkins Poetry Prize, Three NAACP Image Award Nominations, The NCTE Charlotte Huck Honor, and the 2017 Inaugural Pat Conroy Legacy Award. He believes that poetry can change the world, and he uses it to inspire and empower young people around the world through his Writing Workshop. He's led cultural exchange delegations to Brazil, Italy, Singapore, and to Ghana, where he is training teachers and building a library and health clinic, as a part of LEAP for Ghana, an international literacy program he co-founded. The 2018 NEA Read Across America Ambassador, Kwame is also the host and producer of the literary variety/talk show, Bookish, which airs on Facebook Watch. For nearly two centuries, HMH Trade Publishing has published some of the world's most renowned novels, nonfiction, children's books, and reference works. As part of a leading global learning company, it is uniquely positioned to offer educational and entertaining content for all audiences. Its distinguished author list includes ten Nobel Prize winners, forty-eight Pulitzer Prize winners, fifteen National Book Award winners, and more than one hundred Caldecott, Newbery, Printz, and Sibert Medal and Honor recipients. HMH publishes such distinguished authors as Philip Roth, Temple Grandin, Tim O'Brien, and Amos Oz, and a celebrated roster of children's authors and illustrators including Kwame Alexander, Lois Lowry, and Chris Van Allsburg. HMH is also home to The Best American series®; The Whole30®, Weber Grill, Betty Crocker®, Better Homes and Gardens®, How to Cook Everything®, and other leading lifestyle properties; the Peterson Field Guides®; CliffsNotes™; books by J.R.R. Tolkien; and many iconic children's books and characters, including Curious George®, The Little Prince, and The Polar Express. For more information, visit www.hmhco.com/popular-reading.